Do you dream of sweets? Do you go through your days thinking about desserts, when you can make them and how often you should eat them? Do you read entirely too much information on how sugar reacts to your body, your child's body, the bodies of laboratory animals? Do you wonder if you are truly addicted to sugar and if you really could cut it out of your diet completely for 30, 60, 90 days, or maybe even a whole year? That's me. I don't want to think that I have a sugar problem, I don't want to think that I shouldn't maybe eat sugar each and every day but sometimes I wonder if all the sugar reduction hype holds some water. The latest book I read on the subject, I Quit Sugar, tells me that as an adult woman, I should eat no more than 6 teaspoons a day - and that the sugar involved is not just refined sugar but the sugar present in fruit as well. It was nothing I haven't read before, in many different places and formats, but the simplicity of the information did make me consciously want to reduce my sweet tooth again. It's hard for someone who dreams of sweets. I wish I were one of those people who don't have a sweet tooth. I don't know about those people; I just can't understand them. My natural approach to life, gifted to me no doubt by my beyond wonderful parents, is one of moderation. Eat some cake, just eat one you made yourself and don't eat the whole cake. And don't eat the whole cake you made yourself every day. But even in my moderation sometimes I feel like I just can't get sugar out of my head, like it truly is an addiction. During those times, I like to reduce even more than usual. I like to see if I can go a whole day or two without any sweet stuff at all. Maybe even longer. That happened recently and I switched to green smoothies and cut out desserts completely. If I felt deprived (and I did) I grabbed a soup spoon and set out for the jar of coconut manna. Seriously. It helps. And I also made a variation of a granola recipe in the I Quit Sugar book, which is a surprisingly great granola all by itself, sugar reduction or not. The story of the coconut granola actually goes back a month or so ago when my neighbor asked if I had tried Dang Coconut chips. I hadn't. I actually didn't want to tell her that it's not in my budget at all to buy prepared or packaged snacks. But the same day we talked I did go out and buy a bag because she said they were awesome, and she also said that it was something we should be able to make. She was right: they were awesome (though, truthfully I thought they were almost too sweet), and I did think that for sure it was something I could produce from my home kitchen. 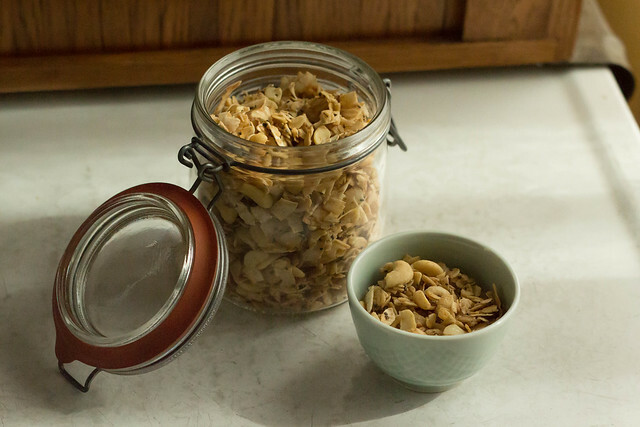 I didn't put the thick cut coconut chips on my bulk grocery list until I read about this granola however - the flavor profile fittingly similar to Dang's being salty, sweet, crunchy. I think it's a win. Sarah Wilson makes this granola without the oats, but I'm not about to go grain free when cutting out sugar... and besides I have a hard time thinking about a granola without rolled oats. It almost makes me sad. Preheat oven to 325. Mix all of the ingredients in a large bowl and mix well to coat. Spread evenly on a parchment lined baking sheet and place in the center of the oven. Start checking at 20 minutes for doneness: you want the granola to be deep golden but not burnt. Stir a few times as you see fit. It will seem very wet and you'll wonder how it will ever be crispy but it will. After it's golden brown, remove from the oven. Use a spatula to scrape it into a mound and let it cool completely. 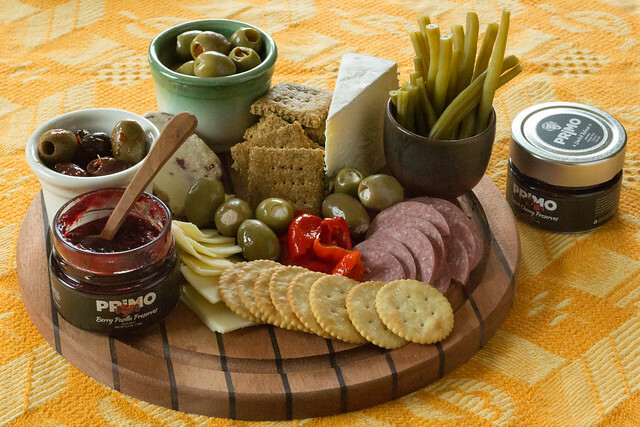 Then store it in glass jars in the freezer, where it will stay extra crisp until you eat it. There is should always be a voice of reason when reading diet related information. We all know sugar isn't the best for us, but is it really that bad? Do I really feel that much better when I'm not eating gobs of it? I do, I'll admit. I enjoyed the posts that Local Kitchen did on sugar last year, and it made me feel confident that a moderate approach to the topic is all that I really want for myself. And maybe when I start getting that sugar-junkie feeling creep up on me, then I dial back and choose non-sweet alternatives, crunchy, barely-sweet alternatives like this granola for a few weeks and then I feel much better. And then I can go back to dreaming about desserts. In the interest of time. Sometimes I feel like I'm floating through the days and weeks somehow just elapse. It's garbage day, it's laundry day, it's library day, it's pizza night. It's a blur. All the time I hear my Mom's echo: "my 30's came in clumps", and my 30's were no exception. Now that I'm at the tail end of them, the elusiveness of enough time seems more than ever present in my thoughts. If I had extra time, I'd start croissants, I'd nixtamalize some corn to make homemade masa for tortillas, I would sit in the backyard with a book. Maybe not even a cookbook, maybe a full-fledged novel. And I'd definitely make more recipes that I'd make time to share with my (hopefully not dwindling) group of readers. Meanwhile, I've got a new batch of cookbooks that I've been cooking heavily from. My time in the kitchen is not as full as I'd like it to be, and yet I still make the time to delve into new recipes. My new crush is the America's Test Kitchen The Complete Vegetarian Cookbook. 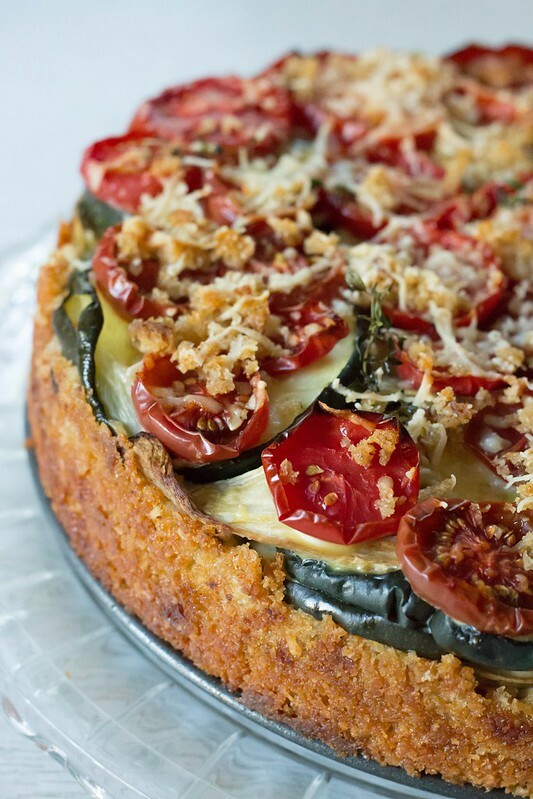 The day I picked it up from the library, I made the cover recipe - a simple tomato tart with a food processor butter crust. Last night, I made the vegetable torta (above). I shouldn't be stunned that these were so wonderful but somehow ATK always makes me feel that way. I know the one thing you should never do when entertaining is cook something you've never made before, but I frequently use their recipes to do just that. The tomato recipes were perfect for my handfuls of garden tomatoes - the precious few that the fusarium wilt didn't get. Both recipes I tried instruct you to dust 1/4 inch thick slices of tomato with a bit of salt on paper towel for a half hour and then blot them carefully to remove some moisture. The result is a super-tomato, meaty with the full summer flavor that by this time of the year you are trying so hard to eat enough of - to sustain you until next tomato season. It's almost difficult to remember the days before homeschooling now, the ones where I spent a good amount of time in my day procuring and preparing food. I remember the canning projects that I didn't need to sneak in just before bedtime, or just before suppertime. Last week my parents brought me a bushel of tomatoes (1/2 Roma and 1/2 regular "canners") and I had no idea how I was going to get them preserved. My Mom washed them all when we were visiting, and arranged them by ripeness on sheet pans, pans I needed to keep moving to ward off my toddler who will eat any ripening fruit or vegetable left on the counter. The ripest 12 pounds I pureed right away in the Vitamix. I left it stashed the puree in the fridge for a couple of days for (Local Kitchen) ketchup. That lazing about in the fridge trick also worked well for the (Food in Jars) tomato jam: 5lbs. of tomatoes that I cooked mostly down before letting it wait in the fridge for awhile. The last 26 lbs. of fruit I determined to roast, puree, and just can in pints. The roasting and pureeing I did on Sunday afternoon and I finally got the canning done yesterday afternoon. 13 jars doesn't seem like all that much when it's resting on the counter. But it is 13 weeks of pizza sauce. 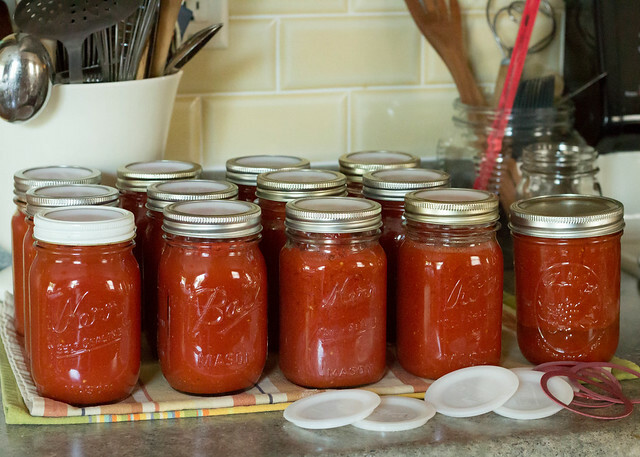 I am immeasurably indebted to my Mom for canning me quarts upon quarts of whole tomatoes for the rest of our tomatoey needs! 1. Make extra rice. Leftover rice seems to be better than rice made for the day. 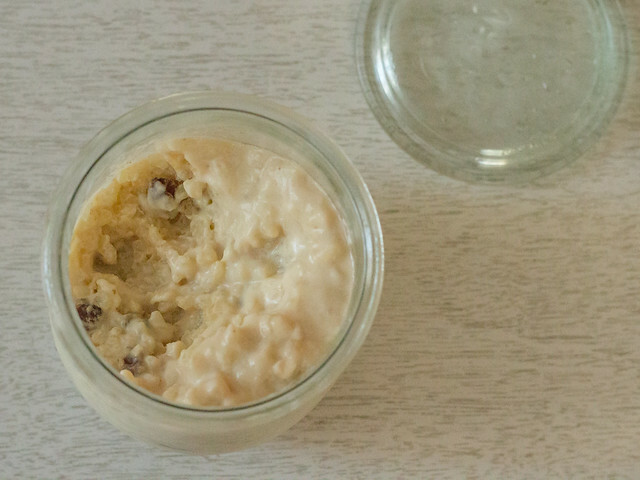 It was Tamar Adler who first made me aware of this and just two days ago I turned the last of some Indian-spiced basmati into a small amount of rice pudding with currants. One boy ate some for dessert, the other happily ate the rest for breakfast. 2. When grating cheese, grate the whole block. You will use it in omelets, on tacos, for a grilled cheese, and you won't have to be bothered to stop and grate it on demand. (Or better yet, if you have the food processor out to do something else that can stand a bit of cheese, drop large, hastily cut cubes of cheese into the running S-Blade. It's not grated or shredded, but it's perfect for melting, sprinkling, using in general.) If you don't think you'll use it up within a week, it actually freezes well too. 3. Slice, dice, or chop extra vegetables. Whatever the vegetable, onions and carrots for soup, peppers for frying or sautéing, extra prepped veg means less chopping later and more chance that I'll include them in something fast. 4. Cold Brew Coffee. It's definitely something I relied on all summer, but I think it will have a moment this fall as well. I am the only coffee drinker around here, and some mornings a pause to make myself a moka pot or a cup of Aeropress is just too much to ask of me. For mine, I coarsely grind 4 oz. of beans, soak it in 4 1/2 c. (36 oz.) 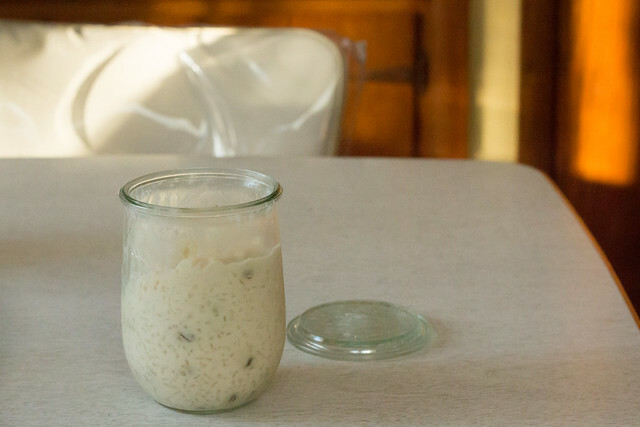 filtered, room temperature water for 20 hours, then strain through a double layer of nut milk bag and decant to a quart jar. It keeps a week in the fridge. It's marvelous with heavy cream and a splash of maple syrup. 5. Extra scrambled eggs. Scrambled eggs are actually pretty good cold, and make good additions to sandwiches, tacos, and my gut when unexpected "hanger" strikes. 6. Always soak a pound of beans. I just recently got smart on this one. We generally eat a half pound over a couple of days, no matter what the variety. Making more leaves a batch for the freezer, which is good in a pinch or when I haven't planned ahead. I could also add bread. Always bread. Earlier this year I was feeling bad about my lack of sourdough experimentation and a Flickr friend commented back that so many people buy the same cereal or ketchup for years and think nothing of it - and that really changed my perception of the joy of repetition. This is my bread, it's always kind of the same, but always just a little different. And it's good for and in everything. In fact, America's Test Kitchen told me to use white sandwich bread in that vegetable torta, but I used my own bread to wonderful effect. I never want for croutons or bread crumbs and when I sometimes feel sad that I don't have the time to devote to long and drawn out kitchen projects, I rest on the bread that I still can't believe I can make myself. 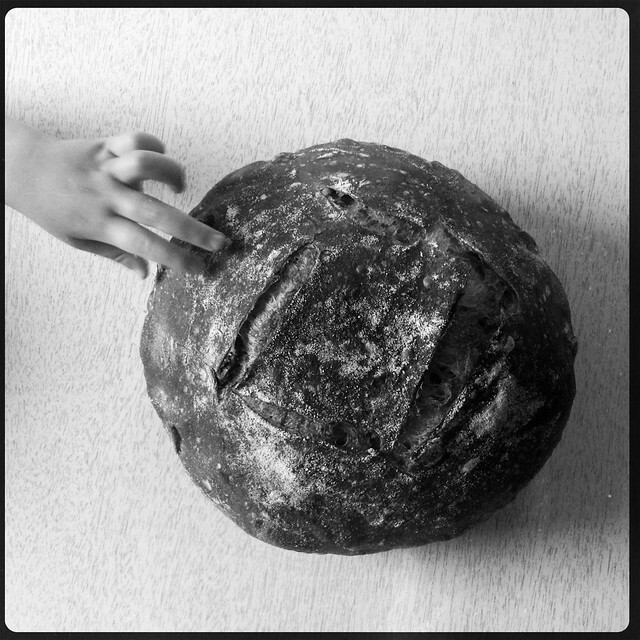 The moments devoted to good bread have given me back so many more minutes than I can count, and made them filled to overflowing... Reminding me all the more the reason it is a stable staple and spirit-filled entity. If you have a good slice of bread, you have the whole world. In Search of Poppy Seed Muffins. 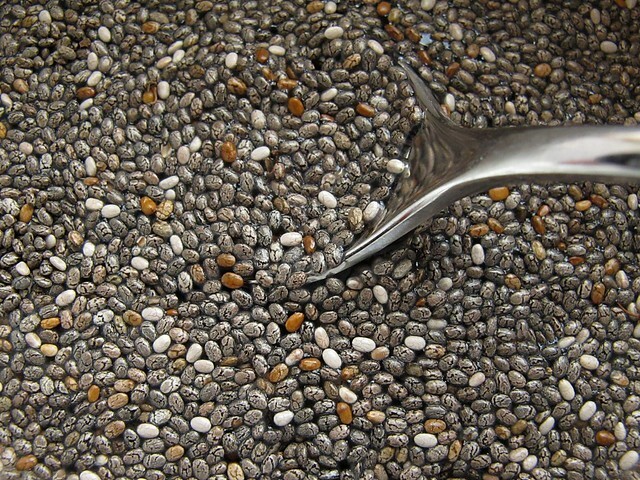 Sometimes I get intense cravings for poppy seeds. Maybe it's the Eastern European heritage, maybe it's the nutty, oily crunch only they can give a baked good. Maybe it's because I enjoy them most as a vehicle for almond extract, since the poppy seed seems more than well suited to that bitter almond flavor. In my flavor showdown between vanilla. lemon, and almond, almond wins out every single time. Then there are the muffin tin liners: to use or not to use? But every so often, I really want a muffin. And, I really want a poppy seed muffin. And then I remember that I've never really found the perfect muffin to satisfy what in my mind a poppy seed muffin should be. 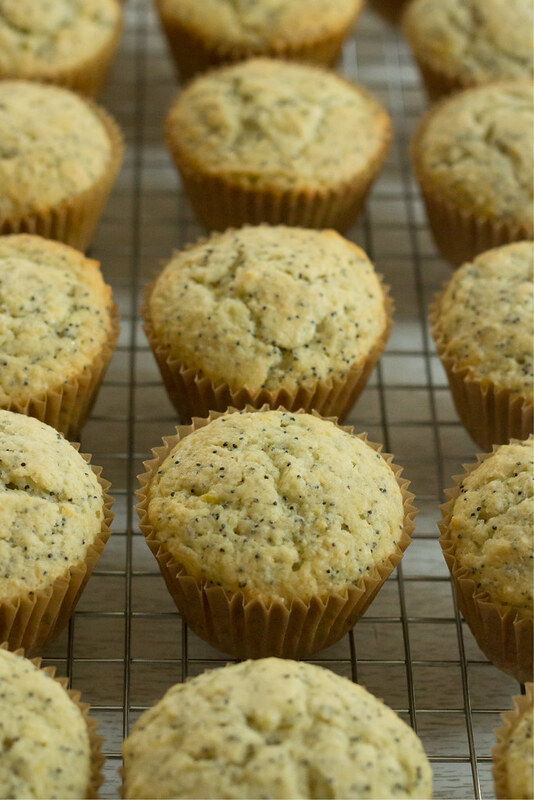 Poppy seed muffins seem to come in either lemon or almond flavors. Lemon leaves me wanting as much as I like it, and almond muffins never seem to contain the bracing amount of almond extract that I so badly desire. 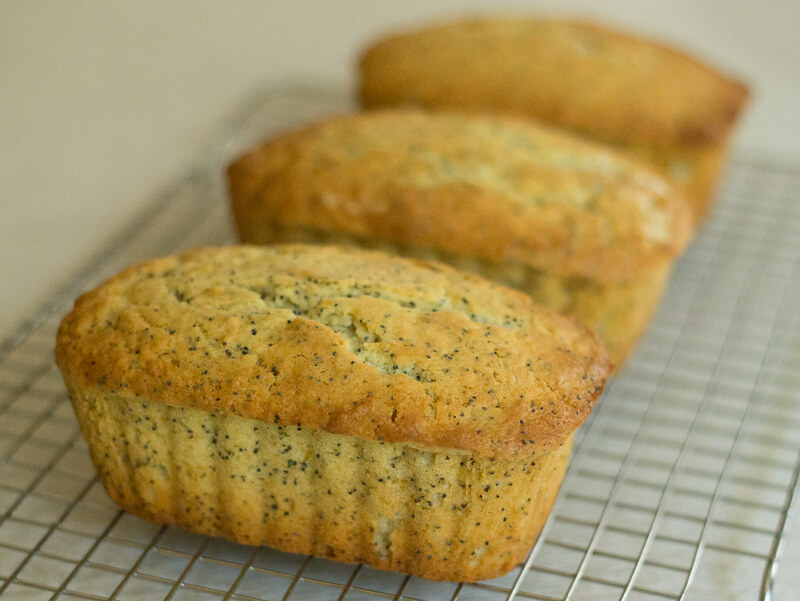 Most poppy seed muffins are dense and overly oily - probably because most are oil based and contain a LOT of it. Most are crazy sweet too, containing as much sugar as flour in some instances. 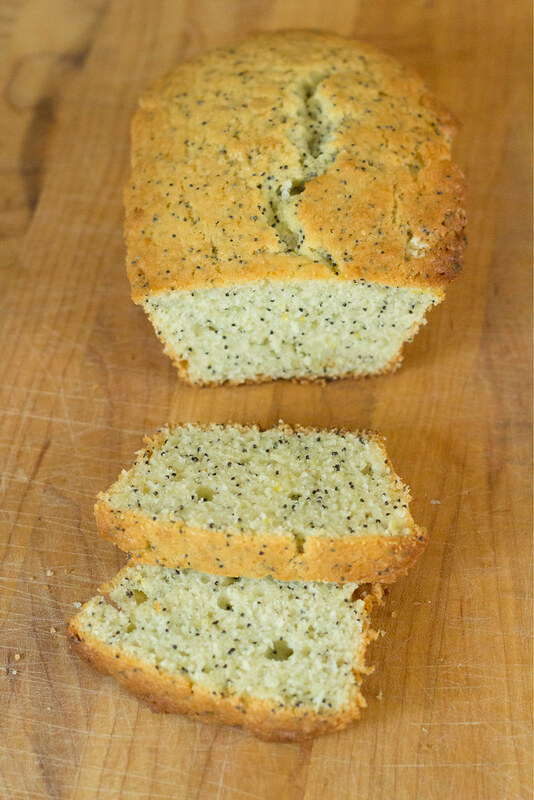 A recent Internet perusal of poppy seed muffins/loaf breads met with the same results I've been accustomed to, but fortunately I was able to turn to a recent cookbook crush to meet my needs. I think I identify most with cookbook obsessed home cooks. We are the lot that hears mention of a new book (or are even the ones that scan publisher websites for upcoming releases), get our hands on a copy, and then set to work making what marvels lurk inside. I have so many titles that seem like living, breathing friends, the authors voices coaching me through the language of their worlds. I have learned so much from so many titles, and been endlessly inspired. Those who are with me also fully understand the "cookbook crush", and I'll bet that a whole genre of my peers can site readily those tomes that grabbed them tenderly (or vigorously) and caused them to think of nothing other than what was on the page and on the plate for days on end. I go through many of these each year, and increasingly there are just so many great books coming out that I never need to wonder what to make next at my house. Lemon AND almond! I have read poppy seed recipes for years and never have seen the two together. And despite my almond addition, I did add the zest of 1 lemon and found it to balance everything well. This was also a butter-based bread, with only 1 cup of sugar in pleasant proportion to the 2 cups of flour (and 1/2 c. almond meal). I was sold. Billed as a loaf cake, I actually made it pretty much as written on the first go. I baked it in small, disposable tins - disposable except I've been washing them out and reusing them since last Christmas when I wanted to give petite pound cakes as gifts. (Sometimes, I think the best bakeware is the absolute cheapest. The thin aluminum allows great browning on all sides.) There was probably a bit too much batter for the 3 pans, and that's when I conceded that a muffin might be in my future. I altered it a little bit more, decided upon using tin liners, and lined up a couple neighbors to share in the wealth of muffins. 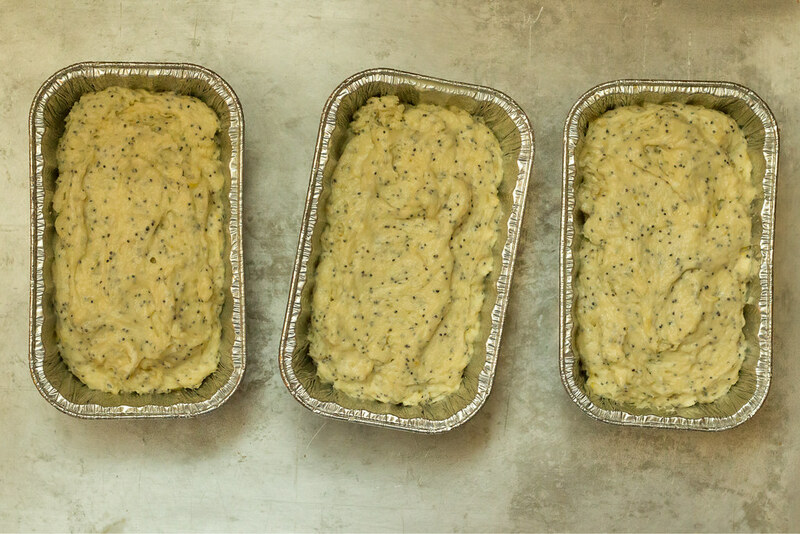 Preheat the oven to 350, and butter your loaf pan(s) or line muffin tins with liners. In a large bowl, whisk the flour, baking powder, baking soda, salt, almond meal, poppy seeds, and lemon zest together until well blended. In the bowl of a stand mixer (or another bowl with a hand mixer), cream the butter and sugar until lightened and "fluffy", about 5 minutes. Mix in the eggs, one at a time, beating for 1 minute after each addition, then beat in the almond extract. On low speed, mix in half of the dry ingredients until just blended. Add the yogurt, also blended until just incorporated, then add the final half of the dry ingredients. Mix well, but don't overmix - and use a spatula for the final few strokes to be sure there are no dry pockets. The batter will be somewhat stiff. Portion into the prepared muffin tins (or loaf pans), filling about 3/4 of the way full. Bake for 20-25 minutes for muffins, slightly longer for mini-loaves, and 45-55 minutes for a large loaf. A tester should come out cleanly from the center and the tops should be slightly browned. Leftovers store well at room temperature for 2 or 3 days if covered tightly with glass. I'll admit that these taste best after just coming to room temperature; the tops have a slight crust that disappears by the next day. 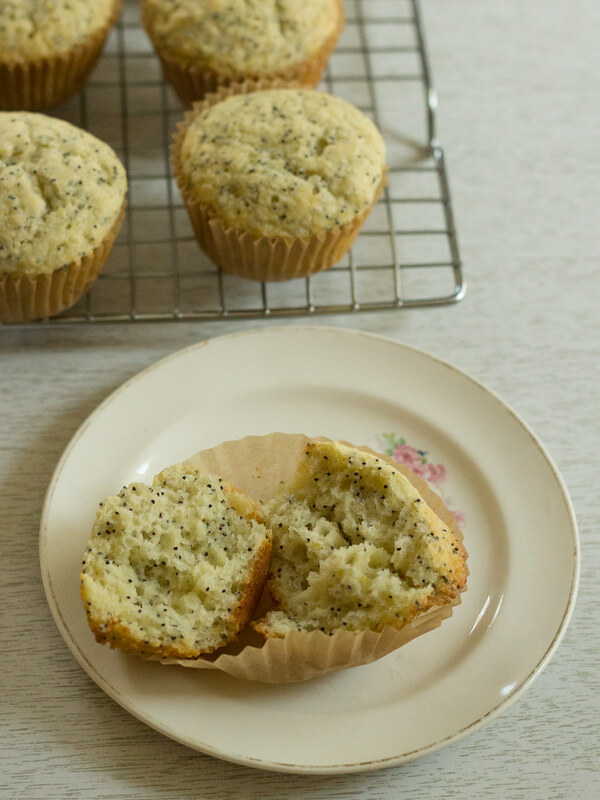 But the airy yet stable structure of these muffins are just what I have been looking for, and I was able to enough almond extract to satisfy myself and 3 tablespoons of poppy seed are enough to give them a good crunch in every bite. You could decide to glaze these with confectioner's sugar thinned with lemon juice, or more almond extract (and milk or cream instead of the lemon juice) - but they are just fine as is. Next time I have the craving for a poppy seed muffin, I'll know just where to turn.